In the previous post I introduced a five-dimensional framework to employ while setting up a corporate venture group and discussed in detail two of its dimensions: strategy and people. The corporation must establish a long-term strategy for its venture group. As part of this strategy it must create a set of objectives, formulate an investment thesis, decide on the stage of the target investments, the life of each fund, and the amount per investment. Recognizing that venture investing is a peoples business, the CVC must pay particular attention in hiring well. A CVC group may have up to six different teams depending on the scope of its activities and overall strategy. Next I will present the three additional dimensions: the incentives to offer to the members of the corporate venture group, generating the right deal flow to achieve the group’s strategy and investment theses, and guidelines for the CVC group’s governance. Creating the right reward or compensation incentives for the members of the corporate venture group is the hardest dimension to address in my framework. It requires the alignment of the corporate leadership and of the CVC leadership on investment strategy, risks, and the appropriate financial rewards for these risks, as well as agreement on the innovation-KPIs. In order to better appreciate the difficulties of the topic it is important to first understand how institutional venture investors incentivize their investment professionals. Institutional venture compensation incentives consist of salary, performance bonus and carry, also known as carried interest (and here). In institutional venture firms, the salary and the performance bonus of every investment professional are paid out of each fund’s management fees. An institutional venture fund typically charges a management fee that averages to 1.5-2.5% per year. Carry is the portion of the profits generated by the portfolio of investments of a venture fund that go to the fund’s investment professionals. In most institutional venture funds the profits are calculated after the amount contributed by the fund’s investors, i.e., its limited partners (LPs), is returned in full. The purpose of the carry is to motivate the performance of the fund’s investment professionals. The carry is typically capped at 20-25% of the fund’s profits. In most cases, institutional venture investors trade salary and annual bonus for carry. Institutional venture investors also contribute to each fund, side by side with their LPs. The contribution ranges from 1-10% of each fund’s size. This means that the IVC’s investment professionals are aligned with their LPs because they participate on both the upside (if the fund does well) and in the downside (if the fund loses money because of poor investment decisions). In designing the right CVC group incentives the corporate leadership together with the CVC group’s leadership must be aligned on the group’s strategy, the risks this strategy carries, the group’s expected contribution to the corporation’s innovation goals, as well as the experience and background of the CVC’s members. For example, a strategic investor investing small amounts (say, up to $3M per investment) in late stage private companies assumes less risk than a financial CVC who leads investments in early stage startups and can invest over $10M per portfolio company. Establishing the contribution to the corporation’s innovation goals is hard because such contribution is difficult to measure. Their measurement requires the establishment of innovation-KPIs, which, as we’ve discussed, corporations find difficult to agree on and set. The way this issue is ultimately handled reflects the corporation’s innovation culture. It is indicative of whether the corporation intends to use the new model for achieving its innovation goals and measuring its impact, or whether it will continue to place R&D as the sole innovation driver. For example, in the case of IBM the company’s R&D organization is still the company’s innovation driver whereas its CVC group plays a more minor role by identifying promising startups for the company to partner. The composition and experience of the CVC group’s members, particularly that of its investment team, also impact the form of the offered incentives. Strategic CVCs tend to be staffed by corporate executives who typically join them from another corporate organization,. Such executives tend to expect salary, bonus and option packages that are consistent with their previous experiences. They prefer the certainty of these incentives instead of the potentially higher but less certain financial return that will be based on the ROI of the investments made by the CVC. CVCs with a financial mission or a mission that combines strategic with strategic goals typically include investment professionals with institutional venture experience. Such investment professionals, particularly those with significant IVC experience, will likely expect incentives that are similar to those offered by institutional venture investors, even if their ultimate value is lower than what they were used to with the IVCs. Less experienced IVC investment professionals may be more willing to accept a position in a CVC even without receiving a carry-like incentive. In my experience it is the discussion on whether to offer an incentive with a significant financial value that is tied to the monetary form of the ROI (strategic or financial) resulting from the CVC group’s investments, and resembles the IVC’s carry, that makes this a difficult dimension to address. I’ve seen situations where corporate investment professionals are rewarded on the basis of the size of the portfolio, rather than its quality and the ROI it provides the corporation. This approach provides the wrong incentives. In addition to determining whether to offer an incentive tied to the generated ROI, the corporation must also determine whether to offer it to every CVC member or just to members of the investment team, and what monetary value it will represent. Many corporate CEOs and boards bulk at the possibility that this monetary value could be higher that the total compensation received by the corporation’s top executives, including its CEO. Today the members of many CVC groups expect their corporation to offer them an incentive tied to the ROI provided by their organization. By not offering it the corporation runs the risk of “training” the members of its venture group and then seeing them leave at the first opportunity to join an institutional venture investor, or a better corporate investor that offers better incentives, thus losing the investment knowledge and experience it was able to develop, as well as relations to the startup ecosystem. Strong performance has to be rewarded even if it does not fit the corporation’s average compensation norm. In my opinion the corporation has two ways to create an incentive tied to the monetary ROI created by the CVC’s investments. First, it can offer specially configured option packages. These packages should have two characteristics: be of significant value, e.g., commensurate to the packages top corporate executives would receive rather than mid-level executives, and have vesting schedules that are tied to the investment timelines. For example, the vesting schedule for investors working with early stage startups can be 7-8 years rather than the typical 3-4 year vesting schedule of corporate option grants. It will also be important for the option packages of high-performing investment professionals to be refreshed periodically, in the same way that venture-backed startups refresh the option packages of their high-performing executives. Second, a corporation can pre-allocate a portion of the profits it receives from its venture investments for distribution among the members of the CVC group, after it recovers all of its original investments. This will require the corporation to create funds, rather than allocate funding on an investment-by-investment basis off its balance sheet. The distribution of this pre-allocation among the investment professionals should be based on each investment professional’s historic performance, the overall portfolio company performance in the current “fund,” and on the seniority of each investment professional, i.e., partner, associate, etc. Every venture investor, and thus every CVC, wants to invest only in the high-caliber companies that fit the stated investment thesis. To invest in such companies requires that the CVC has deal flow of sufficient volume and quality. Volume is important because only a small percentage, typically 1-2%, of the considered opportunities ultimately become investments. Quality is important for obvious reasons. CVCs are always asking how to build their deal flow to sufficient volume and quality, how and who to partner with in building deal flow with these characteristics, and how to select the right investment opportunities to focus on. It takes a new VC about one year to build deal flow that targets specific sectors within IT, satisfies particular investment criteria and provides an investor with options to consider. It takes longer in fields such as biotech. In creating deal flow the CVC’s investment team will need to determine how to balance its inbound sourcing efforts, i.e., the investment opportunities that come to group from its network, with its outbound efforts, i.e., the investment opportunities that are due to the CVC’s proactive outreach efforts. The key to a successful inbound sourcing effort is the CVC’s relationship network. The broader the network with the right level of relationships, the richer the deal flow can be. CVCs have the opportunity to create broader relationship networks than IVCs by taking full advantage of their corporate position, while in addition developing strong and meaningful relationships with the startup ecosystem. A CVC should be taking full advantage of the relationships its members can create within the corporation. Of great significance are the relationships with the corporation’s business units. At any point in time each business unit may be partnering with several private companies. Each such company represents a potential inbound investment opportunity for the CVC. Partnering closely with the business units will also expose the CVC group to the problems these units are trying or want to address. Each such problem offers the CVC the opportunity to conduct deep sector analyses in order to identify startups that can potentially address it. Once these startups are identified, the CVC’s team can reach out to them to generate outbound investment opportunities. During this process the CVC will not only be able to strengthen its relationship with each business unit, but will also be able to demonstrate to each prospective portfolio company the unique business value it can provide compared to most IVCs. As I’ve been writing, the CVC should also be collaborating closely with the business development and corporate development organizations. These organizations constantly work with many private companies, which in turn can present additional inbound investment opportunities for the CVC group. If the corporation already has a business relationship with the startup, then the CVC group could not only have an easier time convincing the startup to take an investment, but its pre-investment due diligence work would also be greatly facilitated. Finally, if the corporation has also established an incubator or an accelerator, the “graduating” teams can provide proprietary investment opportunities to the CVC group while enabling the corporation to protect and enhance its incubator investments. 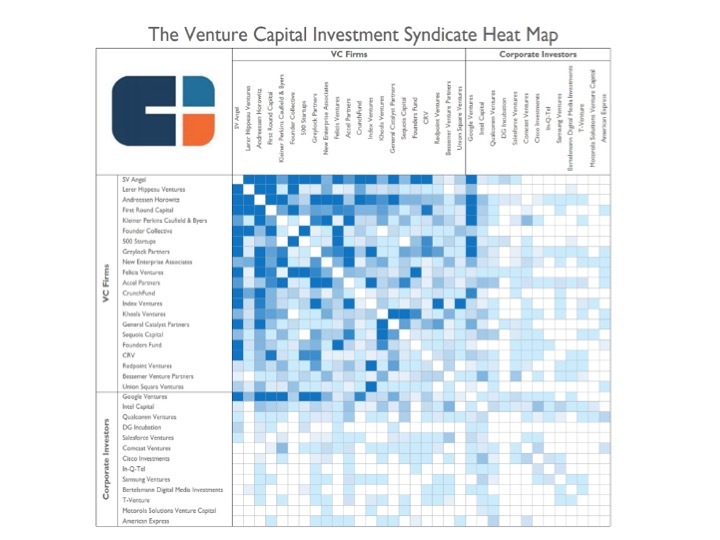 In addition to the internal relationships, every CVC must develop a rich network of external relationships that should include institutional VCs, angels, superangels, executives, startup founders (particularly if the CVC focuses on early stage investments, and is in the position to lead new investments rather than just be part of an investment syndicate), incubators and accelerators, and even other corporate venture investors who may have a similar investment strategy and theses. It is also reasonable for the CVC investing in early stage companies to utilize platforms like AngelList, Kickstarter and Indigogo. The right IVC partners are important not only because they can provide the CVC with vetted investment opportunities, they can help the CVC’s investment team analyze deals it receives from other sources, if they represent co-investment opportunities, as well as access high caliber management teams. The network of trusted IVC partners should include the firms with which the CVC has co-invested, or would like to co-invest, as well as the IVCs where the corporation is an LP. In the process of identifying candidate IVC partners, the CVC will also be forced to articulate the value it will be providing to the IVC and understand the IVCs that will be competitors. In other words, the CVC must justify why the IVC should share with it the higher quality investment opportunities. For this reason it is important for the CVC’s investment team to be able to demonstrate depth of knowledge in particular fields, access to relevant business unit personnel and make certain that this personnel are ready to collaborate with the IVCs. I have seen situation where corporations will bring senior business unit executives to visit with Silicon Valley startups and investors and realize after the fact that these executives have no intention to ever collaborate with the Valley’s ecosystem. It doesn’t take long for IVCs to stop paying attention to these corporations and their venture units. Figure 1 provides a heat map showing the relations between certain IVCs and CVCs. Because of the industry affiliation, it is easier for a CVC to create or access a network of executives than it is for an IVC. Each business unit’s executives can be helpful on this task, as is keeping track of the corporation’s alumni network. For example, many employees from companies like IBM, SAP, Oracle, GE but also Google, Facebook, Amazon and others find their way to startups, either as founders or as members of the management team. By keeping track of its alumni network a corporation can jump-start the creation of its CVC relationship network. Participating in and sponsoring startup-networking events, conferences, and open houses are highly recommended ways to building a broad relationship network that can provide inbound deal flow. Intel Capital, Silicon Valley Bank, Qualcomm Ventures and AMEX Ventures are particularly strong in this type of relationship building. Creating databases of startups, keeping track of detailed data about each company and its team, as well as accessing third-party databases with pertinent information, e.g., Crunchbase, Mattermark, Startup Genome, and CB Insights. Periodically calling the companies of interest to identify investment opportunities. This often requires for the CVC’s investment team to create an investment opportunity where one didn’t exist before. In the process the CVC must convince the startup of the overall value the corporation can provide the startup beyond the investment. Being ready to quickly issue term sheets and making an investment. The outbound sourcing effort depends on the number of new investments a CVC can complete on an annual basis, the investment theses being pursued and the available opportunities that satisfy these theses, and the overall investment environment. An operating committee, which is responsible for establishing and managing the firm’s policies, processes and procedures, e.g., establishing and managing the firm’s annual budget, hiring, reviewing, promoting and letting go of investment professionals, etc. An advisory committee, whose members are its biggest LPs, and which is responsible for reviewing the firm’s financial performance though it should not be thought of as playing the role a board of directors plays for a corporation. As I had mentioned in the section describing the People dimension of the framework, every CVC must have an investment committee and must consider establishing at least an external advisory group. Governance in a CVC group must address the reporting structure to the rest of the corporation and in the process establish who will be making the group’s operating decisions, as well as managing the processes and procedures associated with investment decisions. CVCs that manage funds from several corporations, e.g., Iris Capital, or WiL, must also address LP relations by potentially creating an advisory committee. The CVC’s reporting structure to the rest of the corporation depends on whether the group will be set up as a separate entity or a department within the corporation. 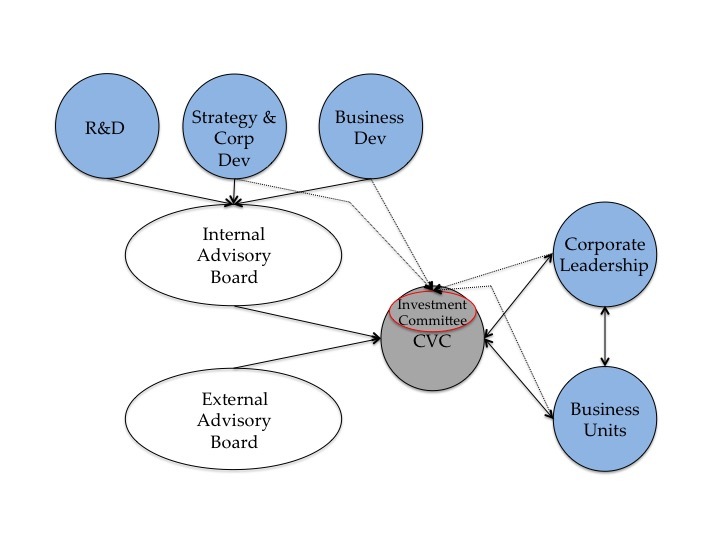 Regardless of how it is set up organizationally, the CVC is connected to the corporate leadership, the business unit leadership and other corporate organizations as shown in Figure 2. If it is set up as a department, then the corporation will need to determine the reporting relation of the CVC’s CEO to the corporate organizational structure. I have seen two alternatives. The CVC’s CEO may either report to the corporate leadership (CEO, CFO, etc. ), or to the head of a business unit. My suggestion on reporting structures would be that the CVC group does not report to the head of corporate R&D because of the potential conflict on how each organization will driving the corporate innovation mission. However, the group’s relationship to the corporate R&D organization regarding innovation must be clarified. If the CVC unit is set up as a separate entity then it is important for its CEO to report to the corporation’s CEO or CFO. In creating the overall investment decision process the CVC must establish the due diligence process for a new investment and follow on investments, as well as the approval process that will be followed by the CVC’s investment committee. This of course will be dependent on whether the CVC leads investments or not, the stage it is investing in (early, growth or late), and the target investment sectors. The due diligence process must include the ways by which the collected information will be documented and potentially shared with the corporate parent. The information collected during the due diligence process allows the CVC to make a big impact on and provide value to its corporate parent. It is also important to decide on the information that can be utilized from diligence conducted by other investors in an investment syndicate the CVC is participating. For example, if the CVC is co-investing with one of its partner IVCs, then its investment team may be willing to accept all the diligence conducted by this IVC, or may choose to conduct only high level confirmatory diligence. The investment committee of the CVC that leads investments must also determine at what point of the diligence process a term sheet will be issued. For example, many VCs issue a term sheet after conducting light diligence and then complete the bulk of their diligence once the term sheet is signed by the company before deciding whether to invest in the company. Others, particularly those investing in later stage opportunities, may first complete 70% of their diligence before issuing a term sheet. While the diligence is conducted, and based on the information gathered and the analyses that are performed by its investment team, the CVC must decide whether to invest and under what terms. The investment committee or just the investment team makes this decision. Certain CVCs, like Intel Capital, require that the head of a business unit always signs off to a future investment before a term sheet is issued. Another element of the investment decision process must address whether the CVC will take a seat on the board of a portfolio company or just an observer seat. I first mentioned this issue when I discussed the framework’s Strategy dimension. Board seats can be a tricky issue. The CVC, and by extension the corporation, must decide whether the board member representing the CVC will vote for the interests of the corporation even if these run counter to the interests of the portfolio company and its other shareholders. For example, try to imagine what happens in the case when the portfolio company receives an acquisition offer from a competitor of the CVC’s parent. An important issue to consider is when the portfolio company in order to continue operating needs to accept an investment that will represent a down round from the valuation the CVC used when it invested in the company. The CVC board member may come under pressure to determine if the corporation will view such a valuation decrease negatively because it will impact the portfolio’s value. Should the CVC refuse to participate in the down round and even walk away from the investment? If it does so, how twill such a decision impact the startup’s management team and the other investors in the syndicate? In other words what may be good for the startup may not be good for the CVC and its corporate parent. Addressing these issues around the investment decision process also has a direct implication on the incentives the corporation will use for the members of the CVC group, and the overall innovation culture it establishes. LP relations. There are few CVCs that invest on behalf of several corporations. As a result, there are no established practices on how to address governance in these situations. My recommendation is for such CVCs to adopt something similar to the IVCs’ advisory committee. In doing so the CVCs will need to make sure that the members of such a group, who will be corporate executives, are able to discuss freely without the concerns of any competitive issues arising and limiting the scope and type of conversations in order to provide true governance. For this reason selecting the LPs for such a CVC is particularly important to the organization’s longevity and success. Setting up a CVC group is a complex process involving a multitude of decisions that are necessary in order for the group to successfully help the corporation achieve its innovation goals. The presented five-dimensional framework aims to help corporations in this process by structuring the type and range of decisions they need to make in order to set up successful CVC groups. The corporation must establish a long-term strategy for its venture group and focus on a set of objectives, a few investment theses and the type of investments its CVC group will be making. Creating a high-caliber CVC group necessitates hiring the right people and organizing them in the appropriate teams. A strong CVC consists of more than a good investment team. The CVC group needs to be properly incentivized. The incentives must take into account the investment strategy, the risks associated with this strategy and properly reward for these risks. Successful venture investing relies on high quality deal flow. CVCs must capitalize on their internal and external relationship networks in order to generate deal flow of adequate volume and quality. Finally, the CVC and its corporate parent must be able to address the reporting structure to the rest of the corporation and in the process establish who will be making the group’s operating decisions, as well as managing the processes and procedures associated with investment decisions.